A recurring feature highlighting BCMB labs. Research Area: Understanding how the epigenome is regulated at a molecular level with a particular focus on histones and histone modifications. What is your favorite thing about BCMB? Elizabeth Meier (EM): When choosing a lab, I appreciated the large number of BCMB faculty with diverse areas of research. I also have enjoyed recruitment weekend: ensuring that prospective students both have a good time and get a realistic idea of what it is like to live in Baltimore and be a graduate student at Hopkins. What does your lab do for fun? EM: Our lab does a lot of joint activities with the Margolis lab such as attending Orioles games, overeating at Indian lunch buffets, and hosting BBQs or holiday parties. Recently, we have started an informal game of Horse in the hallway between our labs using K-cups from our Keurig machine. Where do you see your research going in the next 5 years? EM: To understand how bacterial cells divide, we focus on the function and regulation of the highly conserved tubulin-like protein, FtsZ. Previous work suggests that FtsZ acts as a scaffold for the assembly of the cytokinetic machinery and generates the constrictive force necessary to drive cell division. However, molecular details of force generation on the membrane and how FtsZ superstructure and dynamics relate to its function are still areas of active research. Of particular interest to our lab is how FtsZ interacting proteins regulate FtsZ function over the cell cycle. 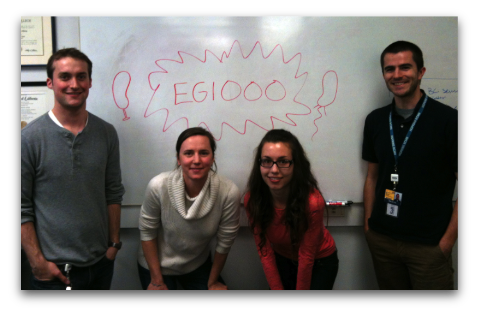 Celebrating the isolation of the thousandth Caulobacter strain in December 2012. Research Area: Physiological roles of signaling lipids and the enzymes that generate them. Dan Raben, in his office. Every year, BCMB increases its list of participating faculty. This year, the two newest members, Chris Potter (Neuroscience) and Frank Bosmans (Physiology), peddled their science before a crowd of potential rotation students at the retreat. BCMB News caught up with them after the retreat to find out a little more about their backgrounds and their research. Chris Potter’s office is sunny and airy, and has a view overlooking Washington Street, on the 4th floor of the Rangos building. Potter welcomes me into his office, and we get to chatting about his journey from grad student to BCMB faculty. “I did my graduate work at Yale, in a fly lab there. My project was to look at tumors in flies.” Upon seeing my look of confusion, he elaborates. “Flies actually do get tumors, surprisingly!” Potter moved from Yale to a postdoctoral position in another fly lab at Stanford University. His lab at Hopkins also uses Drosophila as a model system. “I do like Drosophila!” Potter exclaims. Far from tumorigenesis, his current lab is affiliated with the Department of Neuroscience. “We’ve been here for two years,” says Potter. “I started in March 2010, and then I think somehow I went through a loop-hole and didn’t get added to BCMB right away.” Happily, the situation was remedied, and Potter couldn’t be more excited. “I would LOVE to have a BCMB student,” says Potter. Christoper Potter, Department of Neuroscience. Each month, a different BCMB lab will be interviewed and featured in the BCMB News Lab Spotlight. This month, Diedre Ribbens visited the Robinson Lab in the Department of Cell Biology.